Lauded as the largest urban tropical park in the world, Tijuca Rain Forest Reserve covers nearly 8 thousand acres of tropical rain forest. Many of the plants and animals are exclusively indigenous. This most charming of Carioca neighborhoods blends cobblestone streets and Victorian architecture with a carefree bohemian spirit. Once the home of the Carioca upper class, it now houses artists, musicians, writers, and other free souls. This church's elegant bell tower and carved ceiling, an excellent example of Brazilian Baroque completed in 1720, provide a cul-de-sac of subtlety. Its hilltop situation reveals an urban vista. At the beginning of the Avenida Presidente Vargas, the Igregia Candelaria's white dome and bell towers rise unperturbed in a jungle of downtown streets. This historic side of Rio is most visible in its architecture and museums, both of which are exceptional. 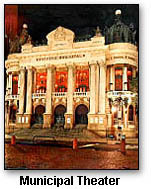 Most famous is the Municipal Theater, built in 1905 and renovated in 1934 in a fashion reminiscent of the Paris Opera. Other major attractions include the Sao Bento Church and Monastery, the Lapa Arches, the Modern Art Museum, Guanabara Palace, Largo do Boticario Square, the Fine Arts Museum, and the Copacaba Fort & Army Historical Museum. Rio de Janeiro's crown jewel in a coronet of mountains, Sugarloaf offers a much-admired view of the city itself. At the end of a breathtaking cable-car ride is a panorama of town and country, or, more correctly, metropolis and jungle. The lesser-known brother to Sugarloaf might actually be the better bet: at almost twice Sugarloaf's height, one has a view not only of Rio but of Sugarloaf. Here stands the iconic Christ the Redeemer Statue, one of the world's largest at 30 meters. Rio's version of Hyde Park is as offbeat as one would expect in the city. Next to a clutch of movie theaters, an open square serves as the platform for political and social debate. Rival groups often speak at the same time -and sometimes come to blows. Of all the dozens of islands in the bay, well-to-do Paqueta is the largest. Its slow way of life lures visitors the world over; cars are banned on the island. To get around, one must bicycle or take a horse-drawn carriage for a very pleasant ride. Ipanema and the curved beach of Copacabana and the immediate environs need no introduction, but Barra da Tijuca and Grumari, distant southern beaches, might be Rio's most well-kept secret. And perhaps it's better that way; Grumari's two snack bars do nothing to mask its isolated magnificence. They are only accessible by car. This natural history museum is worth a visit in itself; coupled with the landscaped pools, parks, and marble statues of its grounds make it easy to while a day away. Rio's Botanical Gardens, which cover a whopping 338 acres, is far more than a picturesque land- scape: it is the largest collection of Amazonian plants in the world and - aside from the Amazon itself - Brazil's most important source for botanical research. Half the garden is open to visitors. No country can claim more World Cup titles than Brazil, and so it seems fitting that no country can claim a bigger stadium. Maracana, the world's largest, was built in 1950 and seats 135 thousands. Brazil's sheer mountains are ideal for hang-gliding, most of which takes place at the ramp on Pedra Bonita (510 meters). Arrangements can be made for lessons and double-flights in which instructors accompany first-timers down to land on the sands of Sao Conrado Beach. Carnival:Rio's Carnival (14 days before Lent) is nothing, if not spectacular. The casual wildness of the city's normal operation unravels into a hedonistic, fantastically-hued blur as the wealthy, the foreign, and the beautiful converge on Rio for a few precious days of abandon. Hippie Fair: On Sundays from 2:00- 6:00pm, Ipanema's Praca (General Osorio) is transformed into a forest of booths carrying woodcarving, leather goods, batiks, rag dolls, jewelry, knickknacks of all descriptions, and well-crafted samba instruments. Journey by cog train up to Corcovado Mountain, watch some of the best soccer player in the world by seeing a Brazilian Football match in the Maracana Stadium, enjoy a delicious meal, followed by a show of traditional Brazilian music and dancing, explore Rio on a Walking Tour or from the air by helicopter. Whether you just need a transfer or want to explore Buzios, Brazil's St. Tropez, click here to choose from the many tours in Rio. Tours starting from 27 USD per person. Geographia has partnered with Viator to provide exciting adventure experiences in St Lucia. Copyright (c) 1998 - 2006 interKnowledge Corp. All rights reserved.